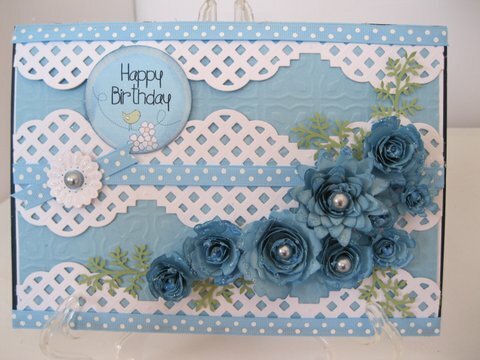 For me there is no substitute to adding this simple decoration to a card. Flowers are so elegant and special and one thing is for sure... these will last a lot longer than the real thing. Then on to roses created with ribbon to the really special Paper Roses which was such a hit. A lot more styles have been covered in between and they are all easy to make. 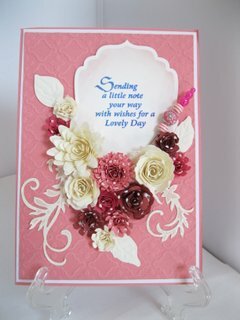 But this flower spray has been created using Spellbinders and the effect is really beautiful on your cards. The tutorial will show you how to get this look for yourself. These have been created using three different flower dies and just by varying the tension in the way they are rolled can give you a different sized flower each time. I have used the Bitty Blossoms, Spiral Blossom 1 and Spiral Blossom 3 and the result is much better when you see it for real. And for yet another style of flower try the Spellbinders Bauble Blossoms. 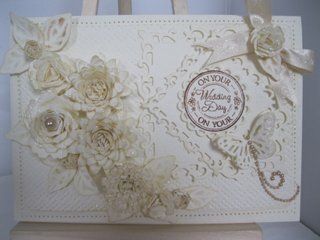 This Wedding Card was Cream on Cream ... which is very up to date and looks so clean and fresh. Try these flowers for yourself, I know you won't be disappointed. And although the dies are a considered purchase they will mean that you will never have to buy flowers again. You can use the card that you use for your base to make them or you can print off papers that you have used for your backgrounds and have the colour scheme throughout your design. Just make sure that your paper is not too flimsy, that way you will have some substance to your Spellbinder Blossoms.